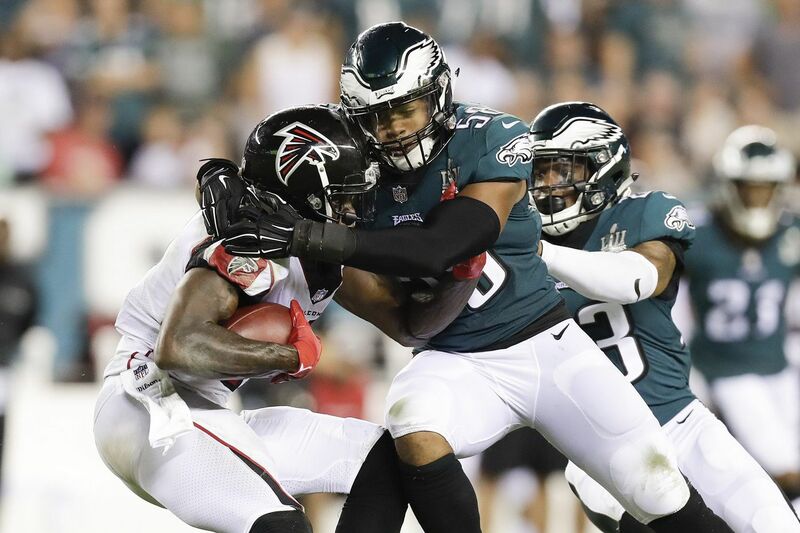 Jordan Hicks stops Falcons wide receiver Julio Jones during the Eagles' season-opening win on Thursday. The Eagles' defense will be tested this week in Tampa Bay. Jim Schwartz watched last Sunday's Tampa Bay Buccaneers-New Orleans Saints game and saw the Bucs total 529 yards, nine plays of 20-or-more yards, and 48 points. "It was eye opening to watch it, for sure," said Schwartz, the Eagles defensive coordinator. The Eagles visit Tampa Bay on Sunday to play the Buccaneers, and the Bucs coaching staff might have a similar reaction watching Schwartz's unit in the season opener. The Eagles limited the Atlanta Falcons to 12 points, keeping them out of the end zone on four of five red-zone trips. "We did enough to win," Schwartz said in his first public comments since the Eagles' 18-12 win on Thursday. "We were sloppy in some areas. I think we had sloppy plays throughout the defense — secondary, linebackers, and defensive line — but we did enough to win." The Eagles did more than that. The 299 yards they allowed were the ninth fewest in the NFL on opening weekend. The 74 rushing yards were sixth fewest. And the 12 points were fourth fewest, which is the most important statistic to Schwartz. He always prioritizes scoring defense. That was exemplified by what the Eagles did in the red zone. "We have good players at three levels of the defense," Schwartz said of the red-zone defense. "We can rush without blitzing. Off those last five plays, there wasn't any blitz in those, even though we did blitz early in the game and created a turnover. We were getting such good pressure that we didn't need to blitz. When you can blitz on your own terms you're at an advantage. It's frustrating if you're not getting pressure and you have to blitz. It can put you in a bad spot." Schwartz also mentioned the poise of his defense. There's "no panic in our players," he said, and he gave the example of Atlanta getting one more play after the Eagles were penalized when they stopped the Falcons on fourth down on the final possession. "If we can either force a turnover or they go for it on fourth down or force them to have to make a field goal, then that's a win for the defense," cornerback Jalen Mills said. The Bucs scored five touchdowns on Sunday, although only two came on red-zone trips. That's because of a big-play offense they exhibited. They displayed offensive firepower with a wide receiver of trio of Mike Evans, DeSean Jackson, and Chris Godwin. Jackson, the former Eagles deep threat, is recovering from a concussion. That trio is tough to defend because they can beat you in different ways – Evans, who is 6-foot-5 and 231 pounds, is one of the NFL's most imposing wide receivers, Jackson's deep speed is well known in Philadelphia, and Godwin, a Penn State product, is an emerging player. Add in tight ends O.J. Howard and Cameron Brate, and the Eagles pass defense will be tested. Safety Rodney McLeod, who is often the Eagles' centerfielder, must be tasked with limiting the deep ball over the top. Of course, it's possible that Fitzpatrick simply had a career day and the Eagles pass rushers will make him look like a journeyman again. Fitzpatrick is only starting because Jameis Winston is suspended. The Bucs didn't show this explosive offense last season, even though they had the talent. "He got hot, and New Orleans had a hard time getting him stopped," Schwartz said Fitzpatrick, who has started for seven different teams in his 14-year career. Fitzpatrick wasn't sacked in the opener. That might be different this weekend. The Eagles defense is built around the pass rush. But the Eagles defense must prove they can play that way on the road. The Eagles allowed 24.6 points in their nine games away from Lincoln Financial Field last season, including the Super Bowl. They allowed 11.8 points in 10 home games. It's going to be a humid afternoon in Tampa on Sunday, and the Eagles must find a way to cool down Week 1's highest-scoring offense. The Eagles signed safety Tre Sullivan to the practice squad and released cornerback Da'Vante Bausby. Sullivan was on the 53-man roster last week before the Eagles waived him to make room for Deiondre' Hall. … Offensive coordinator Mike Groh said Doug Pederson will announce the starting quarterback on Wednesday. … The Eagles are signing WR Kamar Aiken, according to his agent. There's no word yet from Eagles on the corresponding move. Aiken was with the team during training camp and the preseason.